Reprinted from Bloomberg by Hassan Kanu on November 21, 2016. Counties and other municipalities in Kentucky, Michigan, Ohio and Tennessee can pass local right-to-work laws under a ruling by the US Court of Appeals for the Sixth Circuit (Auto Workers Local 3047 v. Hardin County , 2016 BL 384398, 6th Cir., No. 16-5246, 11/18/16 ). The decision marks the first time a federal appeals court has upheld a local right-to-work law, Jim Waters, president of the Bluegrass Institute, told Bloomberg BNA November 18. The ruling has implications “beyond the borders of Kentucky and the borders of the Sixth Circuit,” he said. The Bluegrass Institute is a Kentucky-based public policy organization that has advocated in favor of right-to-work laws. 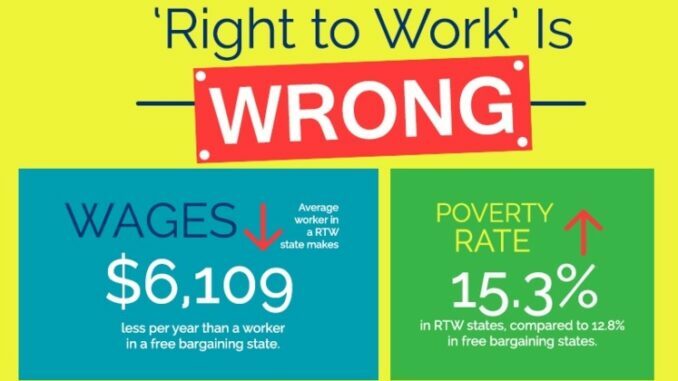 Congress, through the National Labor Relations Act, has long allowed state governments to enact policies referred to as “right to work” laws. The laws prohibit unions from requiring employees to join or pay dues. Generally, unions must nonetheless represent all the workers in a unit, even those who opt out of joining or paying dues. At least 26 states have passed such laws. Local governments in Kentucky, including Hardin County, were the first ones in the nation to pass local right-to-work ordinances, in 2015.